Talking about headphones is getting harder and harder. The offer is greater than ever: manufacturers launch their Wireless models promising identical features. By technological commitment we find new segments where previously there were only construction classifications. In this uncomfortable dichotomy I have seen with the Bowers & Wilkins P7: too good for anybody on the street listening to an AAC of iTunes; Too weak to swear by them in a sounding council. The layman will not have much to scratch here. The learned will have some surprise: once the protocolary hours of filming have passed, the hearing aids are discovered magnificent. Two Englishmen yearning for the grail of perfect sound. At the age of 20, John Bowers met Roy Wilkins while working for the Royal Corps of Signals, the British Army’s communications and support corps. At the end of the war and with some money saved, this tech engineer from Brighton Technical University and his friend founded Bowers & Wilkins Ltd, the sound company with which they would work modestly with public address systems for schools, town halls and churches. The business was running smoothly and they soon recruited Peter Hayward, a childhood friend, for the logistics side. Serving radio and television, the B & W company has achieved a great reputation in the market of HiFi systems. One of her clients, so satisfied by the quality of the products, made a donation via testament of 12772 dollars. In 2010, the British company launched its Bowers & Wilkins P5, entering fully into the market for mid-high range hearing aids. These were followed by the C5, P3 and P5 (supraaural), P9 (circumaural) and P7 that we have in our hands and which we analyze immediately. A black box. A huge box that smells like new shoes. In the foreground, the headphones are wired, folded using the traditional scissor system. Under the encased mold, a second cable of 1.2 meters – owner, of specific curvature – with gold bath, with indicators for the volume (pause and continue call, et cetera), a broad bag for the transport and a stereo adapter of jack 3.5mm to 6.35mm jack, ideal for connecting to an amplifier or sound card. The headset features a sewn leather headband. Yes, real skin, not synthetic. And, although it is extensible, the surplus is hidden inside the diadem. The rest of the connections are firm, the earmuffs have a brushed aluminum finish with the brand logo pressed on both sides. Nothing more, nothing less. The cable controls – clear, to avoid knots – are prepared for Apple devices. With a Moto G5 (model 2016) I could only pause and continue. With a Samsung Galaxy S6 I can also control the volumes. From a 2014 iMac I controlled both actions. Although we will see this later. It is possible to say that there is a model P7 wireless, for 55 dollars plus – and almost 50 grams of extra weight -, ready for listening with Bluetooth connectivity aptX and about 17 hours of autonomy. The brand assures identical qualities, although in this particular I can not throw information. The cup pads are detachable. They are fixed to the structure by means of 4 magnets and two pins like the ones we see in the image. That is, we can exchange them once they suffer wear. And, like P5, they are quite cheap. When the flag is undressed, we see the structure of the driver and the jack connector in the left canopy. Once you have them in your hands you can see the quality of the construction. Not quality said from a comfortable term: they really are firm; They are ready to endure ill-treatment. Luckily, the use of stainless steel on the hinges, for example, does not penalize. We are talking about a headset that with cable included does not exceed 300 grams. The pads, by the way, are double cavity and sound-absorbing filler. Do not forget that we are in front of closed headphones: not only isolate but avoid sound to the outside . And in this task perform much better than, say, a Sennheiser Momentum. Entering more in the kitchen we can see two transducers of 40 millimeters protected by a perforated grid. They are electrodynamic, with damped nylon diaphragm. A classic and functional system, which connects with technologies such as the Tesla system of Beyerdynamic. Two notes: these hearing aids do not amplify or compress. Do not expect powerful, amplified sound that rumbles in the ears because you will not find it here. Nor are they strictly flat, with a mixture slightly shifted towards bass and treble, giving less prominence to the media. On the other hand, even at high volumes to the painful, the headset does not mute. Not only does the glass not rumble, but the circulating air does not impact against the ear, thanks to a chassis ventilated by the upper margin. Each driver is mounted on a rigid structure. As soon as I connected the headset I got the first shock: even though I changed channels from the system preferences, I was not able to play the system audio. I was using Boom 2, a Mac app recommended to mix and amplify the sound. Good warning, this way I would start the test without alterations via software. By the way: yes, you can use this and any other application, it was a simple error when directing the audio output. These P7 are like good glasses: you feel uncomfortable with them the first five minutes. Then they fit like a glove, a “second skin.” They exert adequate pressure on the skull. His headband is less malleable than he would wish. They are so robust that they overwhelm, in a good way. The second scare I took when I started listening to music – it was with this record, a first press inherited from my family – passed straight through a Denon AVR-X. The first contact with a Bowers & Wilkins P7 is not very positive: its sound is something dirty, turbid in media, lacking in color. But if you are hearing instrument users of this range you will know that patience has a prize. And the P7 does not really start ringing until at least the first 40 hours. Of course, what they offer from here is a very fast response in serious. For several days I was trying to stress the headphones with disparate parts – like this one – and continued to show some accentuation in the 20-80 Hz (bass) band. But they look wide, precise, with a brilliant subwoofer – I had never heard Strict Machine with so much body – a sharp sharp and a warm texture. To sum up in one word: versatility. Looking for a benchmark in performance, perhaps the latest Philips Fidelio L2 would be the closest model . Both are able to scale, offer wide scene and give that plus of amplitude when the mix requires it. 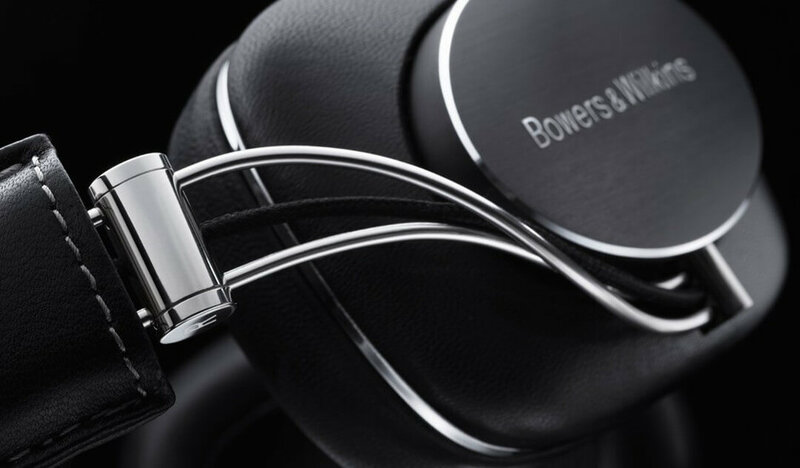 The Bowers & Wilkins P7 give a characteristic thickness without inflating the mixture, rich in nuances, in an organic way. A 3 meter cable with a 6.3mm jack is missing to connect to the stationary equipment and lie on the couch with your feet up. Away from home the cable is more than enough. And they adapt enough to withstand the daily rattling: a subway stretch, a trot to any destination. I have also been able to verify that they perspire quite well, although the higher the temperature, the greater the auditory stress. They are not, in any case, the specific solution for all styles. In vowels, an experienced ear will find some weakness. In fact, they behave better with male than female voices. This is a common perception in closed headphones. No doubt an adult ear will value what these Brits want to offer. They can not compete against the treble of a Sennheiser HD 800 , or the level of precision of a Beyerdynamic T1. Nor do they look for this: they compete in a segment of modern headphones and its sound offers that, a freshness that the totem poles do not always find. It would seem that these Bowers & Wilkins P7 are the rebellious offspring of the aforementioned: looks from you to you, although there will always be some gesture that will affect you. To the eternal question of if they are worth what they cost, the answer is not easy: it is something subjective, adjusted to each pocket. Are we facing a mid-range or a cheap high? For my part, after a week of daily use, for 390 dollars are worth more than what they offer. And it is not saying little.